The comparative map above (click to see at full size) gives a fair indication of areas where birding effort has increased and areas that continue to be under-represented in the eBird database. 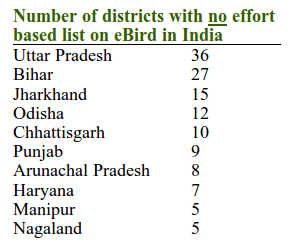 Kerala, Tamil Nadu, Karnataka and Maharashtra continue to be the four largest contributors with around 55% of total effort (in terms of birding hours) concentrated within them. Gujarat has made up significant ground, both in the total number of hours of birding as well as the coverage of the entire state. 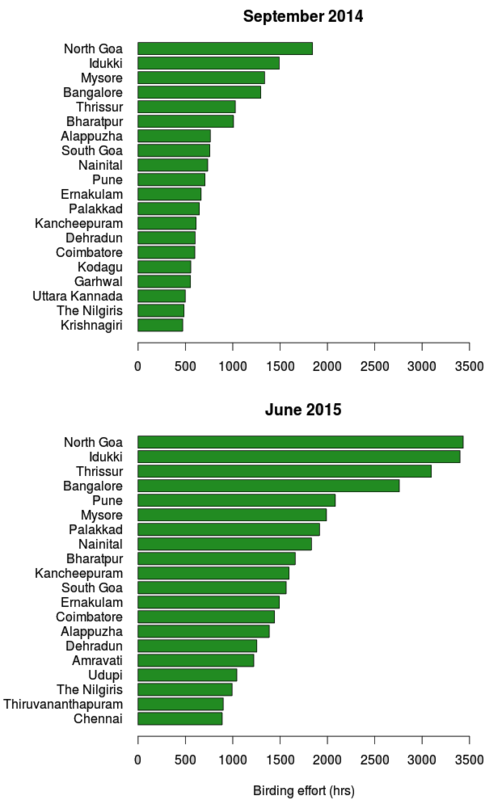 Parts of central Maharashtra (Marathwada), Telangana and Andra Pradesh had major gaps in September 2014 and many of these have been closed but more effort is still required. The biggest gaps in regions of UP, Bihar, Jharkhand, parts of MP, northern Rajasthan and Punjab remain. In the list of gaps, UP leads with 36 district with not a single effort-based list followed by Bihar with 15 districts. The table to the right lists the top 10 states with major birding gaps. If you have old lists lying in your notebooks from these area then this is the another reason to bring it out. All those birders who are also avid travellers, these are the opportunities for pioneering birding! Note: if you would like to explore the raw numbers underlying the summaries described above (perhaps you’d like to see all the districts with zero effort), then you can download an excel file of the data here (corrected version 2015-06-19).